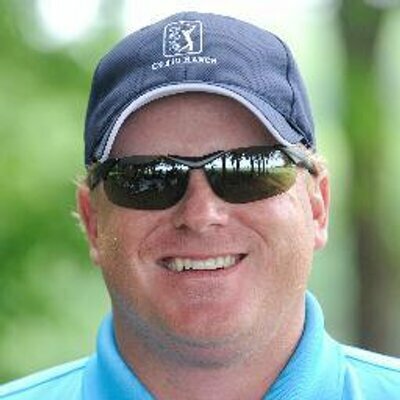 CJ Goecks:	Hey, CJ Goecks from ShortGameSecrets.com. I want to help you out with your alignment. This is one area that I see that really causes a lot of problems for most golfers. Now having been certified and being able to teach other fitting components for putting, a lot of what you're going to do depends on the putter you're using. What's going on behind the putter? That's going to draw your eyes more back which is going to help have you aim a little more left. Where's the line on your putter? Is it more forward? If your line is more forward, that's going to push your eyes more to the right. Do you have a line, or do you not? There's a lot of stuff here, but we're not going to confuse ourself with that yet. What I want you to do is ultimately create your own little training aid. Take a club, lay it down right here. You can even make the little railroad tracks right here, if I'm putting to a hole. At the end of the day, if I can get my feet parallel to this club, and if I get my grip as we talked about earlier in here, you can see my forearms are there, my shaft is going. If my hands are like this, you can see that my shoulders have become unaligned. We want to get that position, that alignment there. Literally, two clubs that you already have in your bag will really help out your alignment. At home, spend time on your kitchen tile or in your bathroom. If you could imagine having the tile here, you can get your face aligned or nice and square. You have a piece of tile this way. That way you can get your feet square. You can get your club aligned. These are really the keys of really knowing how to play better golf because the alignment dictates everything. Spend some time working on your alignment. What I like to do is come in here, put a ball right in front. I even have a little piece of metal or a ruler, and I'll get that in there. I'll set up, make sure my putter face is square, bring the club up. Then I'll hit putts, that way really keeping still but making sure that my putter face is aligned square to my body. If you do this at home, and I want to see if you can recognize the problem here. If I tell one of my students, "Hey, you're aimed right," they do this, so they aim more left. What did they not do? They didn't move their body with it. As you get going here, I want you to understand that your body and your club face form a perfect T every time. If you move your club face a little bit, you've got to move your body with it. If we get you to aim a little bit more left, make sure your body moves with it. Right here you're in a perfect position. You can go back and through, staying still and making sure again to get your feet parallel, get your forearms parallel, get your shoulders parallel. One last little secret for you here. Most golfers that I see have a tendency to get their shoulders open. Why? It's because the ball position gets too forward. Move the ball back a little bit in your stance, but here's the secret. If I'm here, and I'm open, I'm going to grip the club cross-handed. You can see on the camera how my shoulders have squared up. My shoulders are now square, I'm going to switch my hands. I can look at my target, and go back and through. The key to having really good putting and being consistent is alignment. Practice at home on some tile. Reinforce what a square club face looks like with square feet. When you're out on the course, if you've noticed if someone says, "Hey, your shoulders look open, go to the cross-handed drill." That will help square up your shoulders, but remember the cause is more than likely a ball position that's too far forward. Use these secrets, improve your fundamentals and hole more putts.